The fields of morality and ethics have been left out significantly from socio-scientific study in general and in economics and finance in particular. Yet this book argues that in this age of post-modernist analytical inquiry, the study of morality and ethics is an epistemological requirement. 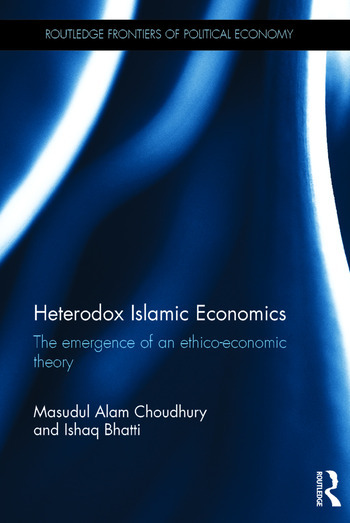 This book illustrates the delimiting nature of mainstream economic reasoning in treating morality and ethics and highlights the potential contribution of analytical monotheism, as typified by the Islamic concept of Tahwid. The principal purpose of this book is to undertake an introductory exploration of the critical area of comparative economic thought in order to place the nature and emergence of ethico-economic theory in its proper context. It is ultimately argued that such a post-orthodoxy revolutionary methodological worldview can be presented by Islamic political economy, Islamic economics and finance. Masudul Alam Choudhury is Professor of Islamic Economics and Finance, Faculty of Economics, Trisakti University, Jakarta, Indonesia. Presently he is Visiting Professor in the Department of Shari’ah and Economics,Academyof Islamic Studies, University of Malaya, Kuala Lumpur, Malaysia. Ishaq Bhatti is Reader, Islamic Finance Program, LaTrobe University, Melbourne, Australia.